Eagle Loop and Athabasca Loop from Eagle River Staging Area are groomed. Creeks are filled in to Virginia Hills road. Please purchase your trail pass and ride safely. The groomer has been working on the Eagle River Trails north of the Athabasca River. Snow is deep but watch for buried hazards. Please support the grooming by purchasing a trail pass. Silver Summit Trail is groomed toward the Tom Hill Road until the groomer got stuck! Manweiler Trail is groomed about half way north to the Athabasca. Packed with Snocat the rest of the way. Groat Canyon Trail and Goodwin Lake Trail are groomed. 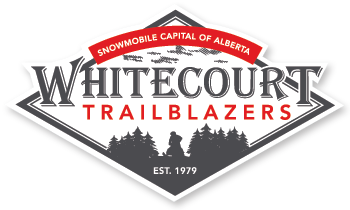 The Whitecourt Trialblazers Snowmobile Club has TWO (2) staging Areas. Eagle River Snowmobile Staging area located 10 kms NorthWest of Whitecourt approximately 1.5 kms north of the Hwy #42 and Hwy #32 Junction on Highway #32 towards Swan Hills. Large parking area commplete with snowmobile load ramp, warm-up shelter, washrooms and direct access to trail system. Approximately 12 kms to Carson Lake Warm-up Shelter (east) and 35 kms to Gundy Rest Area & Warm-Up Shelter (west). Also direct access to Golden Triangle Trial System. Groat Creek Snowmobile Staging area located 18 kms South of Whitecourt on Highway #32 towards Edson. The Staging area is located in the group campground area and includes a temporary snowmobile load ramp, warm-up shelter, washrooms, and direct access to trail system via the new Groat Creek Canyon Trail. Approximately 12 km ride to the Summit Warm-up Shelter. Also direct access to Silver Summit trail. Tons of “off-trail powder” riding within minutes of both staging areas. 2 – 3 ft of powder along thousands of miles of cutlines, pipelines, and old roads. Please use these designated parking areas that have been designed and are for snowmobile use, in order to not interfere with ongoing resource industry work in the area (logging and oilfield operations). The industry in the Whitecourt area is extremely busy and if your vehicle is parked on a lease or logging road it may be towed away or removed without notice, if it is in the way of the industry operation. The snowmobile trail that runs along the power line behind Ravine Drive from the Forest Interpretive Center to Beaver Creek is temporarily closed until January 21, 2011. AltaLink is changing power line posts / structures in that area and the trail has been ploughed to provide access to heavy equipment and vehicle traffic. Watch for signs, but as the trail is closed and there is potential for open excavation, its best to stay off this trail unitl January 21, 2011. Please refer to the PRESS RELEASE issued by the Town of Whitecourt for more information. Snow is great all around Whitecourt. Grooming has begun. Use caution near water and creek banks. Watch for detour on Summit Trail leaving Whitecourt by gunrange…go straight up ditch, don’t cross highway until near airport…watch for signs. Monthly club meeting tomorrow. Remember to buy your trail pass. Have fun and sled safe!